“All I remember [about Buck’s Rock] is a camp full of young people doing things. They weren’t just enjoying life; they were excited about what they were doing. Discovering something. ‘Hey! Did you see what I made? Do you know where we’re going?’ And it was an exciting summer.” -Pete Seeger. 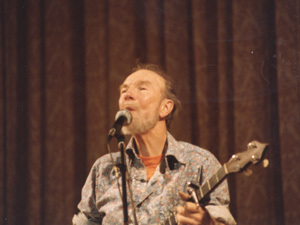 Pete Seeger, the legendary octogenarian folksinger, has sung around the world in almost every imaginable venue, from picket lines to union halls, in concert halls and on sail boats, as well as on the radio, tv and in movies. The list is endless. But one of his favorite places over the years was children’s camps, and among them was Buck’s Rock. Following is an interview conducted by Norman Ross, father of Juliet Ross, a member of our Executive Committee. In the 1980s Juliet’s father published “Rainbow Quest,” 38 TV programs from the 1960s hosted (and produced) by Pete Seeger. He was also the publisher for three years of Broadside, The Topical Song Magazine. Pete was one of the key ‘guiding spirits’ behind Broadside from its inception in 1962. This interview was arranged by Norman, Juliet and Executive Director Jeffrey Paul Bobrick, and was conducted especially for this newsletter. Assisting Mr. Ross in the interview was Jeff M. Ritter, Ph.D., Chair, Communication, Media and Technology, LaRoche College, and formerly editor of Broadside, who also recorded the entire interview on video. Leslie Ross, Juliet’s mom, also participated. Jeff’s wife, Kate Borger, transcribed the interview. Norman: Pete, I’ve seen you perform at least a hundred times and probably double or triple that, starting with the National Guardian boat rides and picnics in the 1950s, at high schools, colleges, a synagogue and a church, opposite the UN and in front of the Washington Monument during demonstrations to end the Vietnam War, and over and over in Carnegie Hall. But I’ve never seen you perform at a children’s camp! And believe me, I feel that I missed out. I’m visiting with you today on behalf of Buck’s Rock, which was founded in 1943 by Ernst and Ilse Bulova, who believed that freedom and structure go hand in hand–that without disciplined, structured effort, little of worth is achieved. From its beginning, Buck’s Rock has recognized both creativity and work as educational values and as a way of life. Youngsters discover that one cannot create by being inactive. One creates and is productive by doing: by painting a picture, writing a poem, playing softball or tennis, performing on stage or in an orchestra. Or as I think you would put it, one creates and is productive not by sitting and listening, but rather by singing along. You were 24 years old in 1943 (and I had just been born) yet you seem to virtually embody the camp’s philosophy. To what extent do you agree with that philosophy? 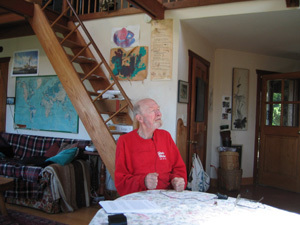 Pete: First of all (for the camera), this is Pete Seeger in Beacon, New York in July 2003, just in case there’s any confusion. I was greatly impressed with the spirit of the young people at Buck’s Rock and I decided that the directors, Ernst and Ilse Bulova, were quite unusual people. So I went back there several times, way back in the fifties and I guess early sixties, and then I got too busy and I haven’t gone back in recent decades. In general, I love to sing in summer camps and I wish there were more of them. In fact, I think every kid in the city, maybe every kid, should go to a summer camp. You can learn things at a summer camp that you can’t often learn in school. Of course there are different kinds of summer camps. Some are just country clubs for rich kids. My favorite camp, I have to confess, is a wilderness camp in the mountains of California where kids get on a bus in the morning and, after a five-hour trip, the bus lets them off at the edge of a forest and they hike seven miles up a trail and emerge on a beautiful view of Mount Shasta, the big old volcano, and there’s a small building there with tools. They all walk with knapsacks on their backs with everything they need for the summer. The first thing they do is set up a tent for each little group, eight kids I think and two adults, and the second thing they do is cook their own supper – each group. And the third thing, you bet they do, is go to sleep, and sleep peacefully. Most of their activities are taking hikes to a lake or a waterfall or a view or something like that. There’s no modern conveniences. And Toshi’s and my nieces and nephews had jobs there. Although I’ve never been to the camp, I’ve heard it described many times. And I still sing at summer camps occasionally. On the other side of the mountains, there’s a Jewish camp. It’s a hundred years old – Surprise Lake. It’s a big, very successful camp and their alumni have been able to keep it going. Every camp needs an alumni association which gets together regularly to see that the camp is on a good financial footing. The danger is sometimes you say, “Well, our alumni don’t have much money; it’s more work than it’s worth to try and get it together.” It may be a lot of work in the beginning but in the end, if you make an alumni gathering a lot of fun, it will keep on going. And when the alumni fun keeps on going, then the camp will keep on going. Norman: I know that you’ve visited many children’s camps over the years because you tell stories about some of these visits on your recordings. For instance, I recall that some campers sang to you, “Pepsi Cola hits the spot, ties your stomach in a knot. Tastes like vinegar, looks like ink. Pepsi Cola is a stinky drink.” I also have heard you describe how you first learned the song Guantanamera at a children’s camp. Can you tell us more about your visits to camps? What was special about them? Pete: Some of my favorite songs I’ve learned from camp counselors. I learned Guantanamera at Camp Woodland up in the Catskills. 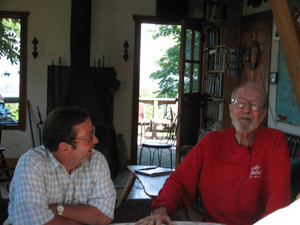 I said “Let me get the words to that!” Like “Let’s go on a Bear Hunt.” I learned that at Camp Hurley in the Catskills and the man who taught it-I think he was just called “Gus” then, but he later became a very well-known scholar. You might consider that getting more scholarship money is a very important thing for broadening the experience of the campers to people who they might not normally meet. If you don’t watch out, camp is full of middle-class kids. But if you can reach out to different kinds of kids from different kinds of places, they suddenly find out what an astonishing and wonderful kind of country this America is, with people from all over the world. There’s hardly any part of the world that doesn’t have somebody here in the U.S.A. And in Queens today, I’m told, there’s a newspaper stand that sells newspapers in 182 languages! Norman: Each summer Buck’s Rock makes an effort to bring to camp both a diverse group of Americans as well as both campers and counselors visiting from foreign countries. Pete: Oh, that’s important. You might consider what a camp up river does. It’s called Camp Rising Sun. (They wanted to spell it “son” as a pun.) The founder went to people in New York who thought that a young teenager who is going to rise in this world should meet other people. So he purposely, in the beginning, invited Catholics, Protestants and Jews. And then later on, went all over the world. So little “Camp Rising Son” (it’s not a big camp–100, maybe 200) has young men and women from maybe 50 countries. And they have alumni reunions in their parts of the world. And this meeting people from other countries becomes very important. It was an exciting camp for me even though originally it had mostly New Yorkers. But the camp developed and now it has kids from all around the world. Oh–you know what he’d do? He’d go to a country, say Nigeria, and he’d say “you have a national airline. If they’ll give a free ticket to some young teenager to come to New York, I will pay for his or her entire summer. Then you will pay for the ticket to come back to Nigeria.” Well, nearly always there’s an extra seat on the airplane, so it doesn’t take any money from the country to send the kid here. And they get a free summer. And they would lay plans to bring in more. This is going to be done more and more. And not just here. It’s going to be done in other parts of the world. If governments find it hard to pay for education, it’s got to be up to us, the people, to find how to do the job that needs doing. If you read the headlines, you can get pretty pessimistic. If you watch television you can get more pessimistic. Jeff: Do you read newspapers every day? Norman: The fish stocks around the world are being depleted. Pete: Wiped out. Well, I think even a crisis has a good side. It’s waking up the world to the danger we’re in. I have a local politician, a good guy, used to be union shop steward in a factory. For 20 years he represented our little town of 13,000 in the county legislature. He says, “Pete. If you don’t grow, you die.” And at 1:00 in the morning, I woke up and thought of the next question. If that’s true, doesn’t it follow that the quicker you grow, the sooner you die? And facing up to this problem really has to be done or we really won’t be here. There won’t be a human race. You may find a little dwindling group here and a dwindling group there, but I don’t think a viable human race will be around. It will be a disaster for 99.99% of us. A real disaster. Jeff: It’s been said the Hudson River has been cleaned up. Is that true? I’d have to say Clearwater’s only halfway cleaned up the Hudson River. It’s not only Clearwater. There are half a dozen organizations: Scenic Hudson, the River Keeper and several others. But it’s swimmable! It’s now safe to swim in the Hudson, roughly from Yonkers to Catskill, and in a few years it will be safe enough to swim in New York City without taking shots. And guess what we’re working on now in my hometown of Beacon? We had a meeting Sunday with a batch of people to see if we can’t have a floating swimming pool. You haul it out of the water in winter; you put it in the water in the spring, and it’s got tubes in a big circle and very tight netting in between. And we’re putting in a small one, I hope, this year. I’m convinced this is better if it’s done by a private, nonprofit group. You can get a little help from the government; we hope for more than less. But we won’t expect the taxpayers to pay for it entirely because time and time again something good gets started and the government’s in charge and a later administration starts trimming the budget: “We’ve got to keep taxes down.” It’s happened to all sorts of projects, you know. This is what’s happening to education now. We’re spending hundreds of billions of dollars to go to war, but we can’t keep the schools going! Norman: Pete, you’ve devoted so much of your life toward making this a better world to live in. 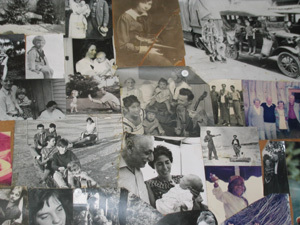 At the same time you have brought up a family, children and grandchildren. How do you deal with handling responsibility to one’s self vs. to the rest of the world? Right now I’m convinced that if there is going to be a human race here in a hundred years, it would be the women of the world starting projects in various places, saying “Something’s got to be done. Can’t do everything, but I’m gonna work on this.” And often right in their home community. When people come up and say, “What should I work on? What’s the most important thing to work on?” I say “Start right where you are; right where you are.” If you look at New York City-it’s a much better city than it was 30 years ago, largely because of 800 little community gardens throughout the city. Of course, the contradiction of the situation is: the garden improves the neighborhood and then the rents gradually go up, in spite of rent control. And finally a developer says, “Hey, I can make some money there now. Get rid of that garden and I can put up a high-rise.” So every city has to face up to this contradiction. You try and improve something and you create problems. As a matter of fact, the entire Hudson Valley is now being gentrified. People who lived here all their lives, the families who’ve lived here hundreds of years, can’t afford to live here any more. Unless they get a little apartment in some high-rise in some city. But they can’t pay the taxes on the land. They can’t buy land. So what my wife and I were able to do 54 years ago–buy a couple of acres on this mountain-would be impossible in the Hudson Valley now. You’d have to go to Canada or to Montana to buy a piece of land like this. We can see the Hudson for about 20 miles, and the Catskills, about 45 miles away. Of course, we see the mistakes too. There was a big mansion across the river. The rich people died and now there’s a hundred little boxes. Leslie: One of my favorite folk singers was Malvina Reynolds. Because of the great souls in our community. Or empty their purses as the plate comes by. Jeff: Is it true you invented the long-necked banjo? Pete: A singer needs to sing a song in the right pitch, and I found myself no longer able to sing songs in a certain high pitch. As a matter of fact, I wanted to sing the song, “Viva La Quince Brigada,” a song of the International Brigade, but I could no longer sing it up in C minor. And I couldn’t play it in G. I could re-tune the strings a bit, but that’s inconvenient. I was in the army at the time and I had a furlough and I got John d’Angelico from the Lower East Side to saw off the neck on my banjo and insert a new piece with two extra frets and glue it back together again. He did a wonderful job. That banjo got stolen in 1949 and I tried several new ones, and finally ended up making a neck for the banjo myself. And so I play that, a banjo with three extra frets. 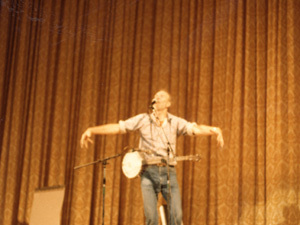 Several companies have made long-necked banjos. Jeff: In writing songs, what comes easy to you and what comes hard? However, in the Library of Congress they played a recording for me of that song sung in1920. Marvin Frey made up the slow version about 1936 or 37. He taught it to a family of missionaries that was going to Angola, and there they changed ‘come by here’ to Kumbaya,’ the African pronunciation. Then it was brought back here. In other words, its not uncommon at all to think you wrote something when in fact you didn’t. You probably know about the man, Clement Moore, who claims he wrote the “Night before Christmas.” But a professor at Vassar, using his computer, studied all the poems written by Clement Moore and all the poems written by a man named Henry Livingstone, and there’s no doubt that it really is Livingston’s poem. They found out that a woman who had worked for Livingston went to work as a nurse for Clement Moore, and it’s most probable that she recited the poem for his children. Clement Moore probably heard it; it went into his subconscious; and he really thought he wrote it. Maybe later on he was ashamed to admit that he’d gotten it from somebody else after he told his family he had written it. His children were very proud that he wrote it, and perhaps he was ashamed to admit he copied it! I think humor just might bring the world together, because it can get us laughing in spite of ourselves. Norman: You might start a new career as a humorist then? Well, this little newsletter my friend sends out–I read it every issue just for the jokes, even though some of them are very very conservative, and we disagree about so many things. Some people get angry with him and say that “Don’t send it to me anymore,” but I keep reading it for the jokes. Norman: I remember when I was about ten years old coming home from school and the McCarthy hearings were on television. You are obviously much more familiar with what was going on in that period than I. But all my life I had the idea, being an optimist, that gradually everything was always going to get better, even though we had our downturns with Nixon and Reagan and Bush I. However, with “W” in office, I am now feeling that this is really the worst time in my life. Do you feel that way too? Pete: It’s as though we are getting closer to Niagara Falls and the question is, will we go over? Or will we be able to save ourselves? After the atom bomb was dropped on Hiroshima, Einstein said “Everything has changed except our way of thinking.” No one really knows how to change our way of thinking. But we must. We are all descended from good killers. The ones who were not good killers didn’t have descendants! Our ancestors were good killers. There are no more saber-tooth tigers in the world, no more Neanderthals, and so on. Now there’s a new situation. It may be that technological societies, anywhere in the universe, destroy themselves. On the other hand, technology might save us if it doesn’t destroy us first. There are miracles that are being done right now, and as bad as some people have been, they have all done some good things. You realize, thanks to Nixon, we have Earth Day, EPA and the fact that some cleanup laws were passed. And it was Reagan’s Surgeon-General, C. Everett Koop, who got millions of Americans to kick the cigarette habit. Now our problem is that even with wonderful things that science is doing, many are done without enough care. Things happen like Thalidomide, and nobody knows for sure what the result of all of our knowledge is going to bring. This is getting off the subject, but I am hoping your daughter can make use of it in some way. Look at it this way. John Adams and Thomas Jefferson corresponded for 13 years before they died. Even though they had been political opponents, they had much in common. For instance, they agreed on the following: How can you have prosperity without commerce? How can you have commerce without luxury? How can you have luxury without corruption? How can you have corruption without the end of the republic? They were pessimistic, and now we see some of the same problems. Now the question is: How can we have a technological society without research? How can we have research without researching dangerous areas? How can we research dangerous areas without discovering dangerous information? How can we discover dangerous information with its falling into the hands of insane people who will use it to destroy the world? I think there is, perhaps, a synthesis. You know Hegel. There is thesis, antithesis, and synthesis, and it is in the song “Turn, Turn, Turn.” There’s a time for discovering and a time for not, and right now the most important things for scientists yet to discover is how to face up to the need to change our way of thinking and to guard against insanity, whether it’s in schools, college or in politics. Anywhere. What he thought for sure would be his masterpiece. Well it didn’t win a prize. It didn’t even get honorable mention. That the judges had laughed at it. It’s all in “Mein Kampf.” So we must find ways to recognize our own occasional insanity. There are times that every one of us gets so angry, we lose our temporary composure. I was trying to sign my name the other day and I started thinking about something, I got so angry I couldn’t sign my name properly. Norman: Do you still think our society is moving in the right direction? Pete: If there is a world here a thousand years from now, I don’t think it’ll be like heaven on earth, where everybody agrees with each other and everyone is smiling all the time. Pat Boone wrote something for a book saying that he hopes when he dies that he’ll go where his parents are, and they’ll be right there in the neighborhood where he can live. No, if there’s a human race a thousand years from now, we’ll learn to laugh at the same time as we cry, and we’ll use humor as much as seriousness to solve our problems. We’ll still be in danger. I don’t think we’ll ever be as safe as we were hundreds of years ago when we were blissfully ignorant. On the other hand, I think we can have a human race here. If…. Norman: There are always lots of singers and songwriters around, but almost all of them only sing their own songs. It seems to me that nobody but you sings traditional ‘folk music.’ You’ve lost your voice, as you’ve said. So who’s going to sing traditional songs in the future, or are we going to just forget them, stored in the Library of Congress and the National Archives? Pete: There are groups of people all over the country that like to sing all kinds of traditional songs. They’re not large groups, but with the Internet, they are able to get together, they find each other. That’s one of the wonderful things about the Internet. They’re a thousand miles away but they get together to sing. One of the greatest Christmas songs is a Catalonian one. My father used to play it on the piano. I thought it was Mexican because my father was born in Mexico City. I was singing in Spain once and I said “does anybody know this old Mexican folksong?” They laughed. “That’s a Catalonian song.” I was in Barcelona and they all knew it very well. It’s a great song. Yes, there are people singing the old songs, mixed up with the new ones. I think most of the world will be at least bilingual. This country will soon be bilingual: Spanish and English. However, have you heard the song, “English is Crazy?” Everywhere I go I sing it, whether I’m singing for eight-year-olds or eighty-year-olds. Josh White, Jr. told me just two weeks ago that he was reading the Readers Digest version of the book by Richard Lederer, “English is Crazy,” and he started laughing so hard…. He memorized some of the lines out of it and made a rap out of it. I heard him do it–it was a long rap–about five minutes. I decided to cut it down and make it about two minutes long and I added a little refrain. I had the pleasure of singing it for Josh. He and I were both at the Woody Guthrie Folk Festival in the little town where Woody was born and raised, Okemah Oklahoma. For 40 or 50 years they wouldn’t have anything to do with Woody Guthrie. “He was an atheist and a Communist.” But a friend of mine, Larry Long, got to the school there and taught the kids some of his songs, and Arlo Guthrie came down and in the one little theater in town they gave a program of Woody’s songs, and the parents of the children said ‘these are wonderful songs. Who cares what names they call him? These are wonderful songs,’ and they decided to put on a Woody Guthrie Free Folk Festival, and invited people from neighboring towns. It was so much fun they put on another one. Last month was their sixth. Arlo brought down about 15 members of his family, daughters, sons, grandchildren, some of whom were part African-American. There were very few African-Americans in the audience, but there will be more in the future because every year that little festival becomes better. This year they had two African-American performers, one of them was Josh White, Jr. I did his “English is Crazy,” and I had 10,000 people sitting out there in a big field and I had them singing the little refrain, English is Cuh-ray-zee. Norman: Pete, thank you so much. This has been an extraordinary experience for me and I’m sure for Jeff and Leslie as well. It was very generous of you to invite us into your home and to give us all this time-after giving me and the rest of the world so many hundreds of songs and so many thousands of hours of listening to you sing them. Pete: We didn’t talk much about Buck’s Rock, Nor about Ernst and Ilse! Norman: Do you remember being at the camp? Pete: All I remember is a camp full of young people doing things. They weren’t just enjoying life; they were excited about what they were doing. Discovering something. “Hey! Did you see what I made? Do you know where we’re going?” It was an exciting summer. Norman: I think it was Ernst’s idea that the camp should provide the facilities and let the children choose what they wanted to do, not ringing a bell, and saying “Now everybody’s going to go swimming.” Buck’s Rock is a kind of free-flowing place. Pete: How many campers, about? Norman: As many as 500 over the course of a summer. Pete: My older brother ran a summer camp in Northern Vermont. One of their great achievements is limiting it to 200. It’s easy to keep growing, but little by little you lose the quality. And kids don’t know everybody by their first name anymore. So they limited it to 200. Everybody, every kid in the country ought to go to summer camp. I confess though, come to think of it, I never went to a summer camp and didn’t miss it, because each summer my father, who was a professor, completely stopped his professorial work, didn’t write a lot of letters, didn’t answer the phone, for three months. And he just enjoyed his three boys. One summer we all made model airplanes. Another summer we all made model boats. Another summer we were all busy playing “barn squash.” We lived in the barn, camped out in the barn. No running water, no electricity. We went to bed early and got up early. But we used two or three walls of my grandparents’ barn to bounce tennis balls against it; we called it “barn squash.” And another summer we’d take hikes to interesting mountains and lakes. So I didn’t feel the lack, intellectually or physically at all, of not going to camp. We just had wonderful summers until my brothers all grew up. Then my father remarried and got a job in Washington. And the summers at my grandparents’ barn were all over by the time I was about 13. Norman: So you had your own family camp. Pete: Yep, we had our own family camp. We had a big garden. About 11:00 in the morning, father would say, ‘let’s see what’s in the garden.” And we’d stroll down the rows and say, “I wonder how that would taste if we boiled it with this?” And we ‘d have a different kind of salad or vegetable soup every day. And we learned to make bread, and we learned to make ice cream the old fashioned way. You know– you’d buy some ice and churn it. And we had a carpentry shop right in the barn there. I still use the blacksmith vise my father bought. Then along comes World War I. My father had been radicalized by his fellow colleagues. He started to speak out – the American way! He was making speeches against imperialist war. And in 1918 he was given a sabbatical and told not to come back. He then built a trailer and bought a model T Ford. I was only a baby. He was going to take ‘good music’ out to the small towns. He thought, ‘why should we play our good music just for people in the city?’ Well, the trailer didn’t get far. We got to Pinehurst, South Carolina, and holed up for the winter in a woodlot in the back of a farm. One evening my mother and father took the violin and the little pump organ that they had up to the McKenzie farmhouse to play their Bach and Beethoven. The McKenzies said, “That’s very nice. We play a little music too,” and they took down banjos and fiddles and played up a storm. My father said, “For the first time I realized that the people had a lot of good music themselves and they didn’t need my ‘good music’ as much as I thought.” But my mother put her foot down and said “This is not going to work [traveling around in a trailer and trading music in farmhouses]. So they returned to New York and got jobs at what became the Juilliard School of Music. They worked there in the twenties. They drifted apart and got divorced. My father got married again…. One more story–from 1960. A true one! The story starts when John Hayes, a black policeman in Union City, New Jersey, says to his wife, “Let’s go to Niagara Falls.” So they picked a date and drove up there. The first hotel turned ‘em down because of their dark skin. But another hotel took them in. They freshened up, then went out and strolled across the footbridge to Goat Island between the American falls and the big Canadian falls. Now that day a man in the city of Niagara Falls, who had a little motorboat, invited a seven-year-old boy and his sister, aged 17, out for a ride on the river, above the falls. Their father said, “Do you have life jackets?” “Oh yes, I got plenty,” said the man. So they started off. But something went wrong with the motor. The man bent down to try to fix it. There’s a Coast Guard Station on Georges Island, several miles above the falls. But someone wasn’t doing his job that day and the little boat went right past. The man straightened up to realize that the boat was about to go over the falls. He says to the girl, “Swim for it. You may get to Goat Island.” Then he strapped two life jackets on her brother. He and the boy went over the falls. Once on deck the seven-year-old said, “Boy, that’s noisy. You could get killed doing that.” He didn’t know it, but he was the first person in history to go over Niagara Falls with only a life jacket and live. Miracles do happen. The human race may still be here in centuries to come. This entry was posted on June 5, 2008 at 9:02 pm and is filed under Uncategorized. You can follow any responses to this entry through the RSS 2.0 feed. You can leave a response, or trackback from your own site.